Need Plastic Parts Making? Ask our Plastic Guru! April 25, 2017 / Richard Stamps / Comments Off on Need Plastic Parts Making? Ask our Plastic Guru! 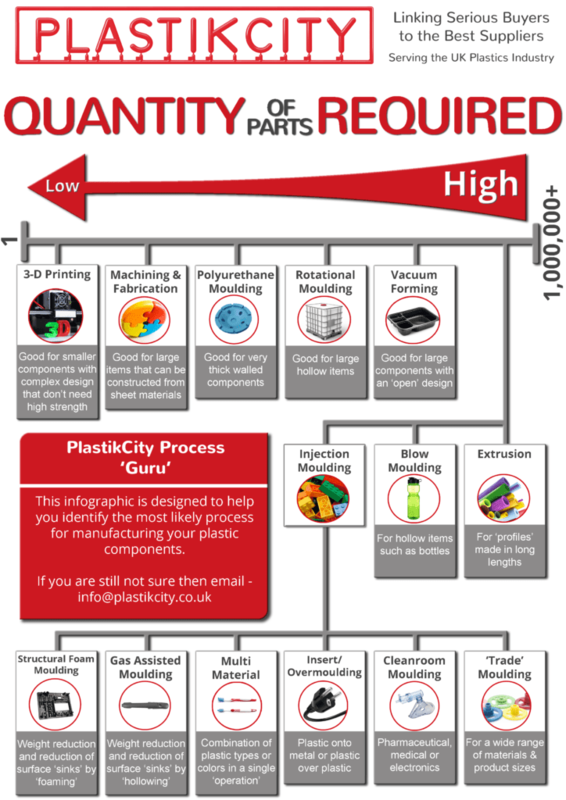 OK, so we aren’t the Plastic Gurus in question (it’s the below handy Infographic), but at PlastikCity we operate both a Help Desk and an Assisted Service facility within our Source a Moulder section, so we have first-hand experience when it comes to ‘pointing people in the right direction’. – Volume required versus up-front costs for tooling and production. 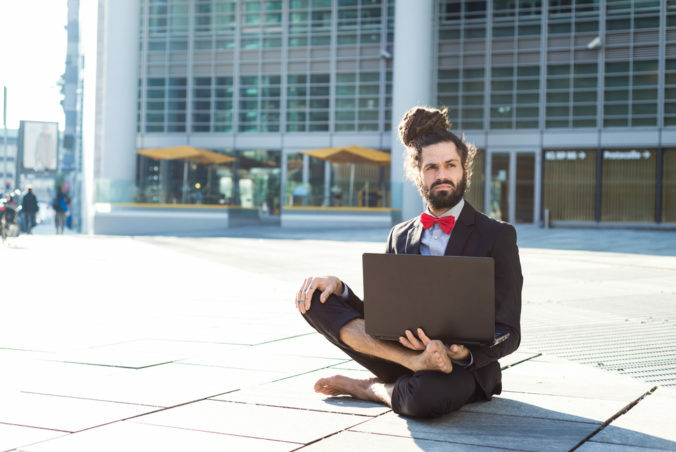 – The physical nature of the product itself, e.g. size and form. In the first case, some processes have high up-front costs, but relatively low cost per item when it comes to actual manufacture, so are best suited to high volume work. Other processes have high per item production cost, but minimal outlay for tooling, so make sense if you only need a few parts making. In the second case, each manufacturing process varies in what general shapes and forms can be produced. In this Blog, we are providing information about which process best suits what type of product. More detail is given below, but as a starting point, this Infographic links typical volume requirements to the more common process types. Below is more detail about each production process, where costs are ‘heaviest’ and the types of products that they do or don’t suit. You can find specialists in all of these fields by visiting the PlastikCity Source a Moulder section. Injection moulding is a manufacturing process for producing parts by the high-pressure injection of molten plastic material into a mould, where it is then cooled prior to mould opening then ejection or removal by a robot. The mould or ‘tool’ has two halves, one containing a ‘male’ core and the other a cavity. When closed, the gap between core and cavity is where the moulding is formed. Limitations relate to the need to be able to remove the finished item once cooled, so for example, a hollow ball couldn’t be produced without making it in two halves and then welding or bonding these together. Initial tooling costs can be relatively high, but tools can have a long service life. Injection moulding machines can also run continuously for long periods of time, making this process best suited to high volume production. There are a huge variety of polymer grades that can be selected, this depending on the application. Colour and additives can also be introduced, for example, the addition of glass fibre can produce plastic components that are sufficiently strong to allow for the replacement of previously metal parts. The speed at which components can be produced (cycle time) depends on the wall thickness of the plastic in combination with the amount of cooling capacity within the production tool. Thin walled food containers can be produced with sub five second cycle times, often using multi-impression tools. Moulding machines are highly accurate and range widely in their physical size. This means that components weighing a few grams or large items such as car bumpers can be made by injection moulding. Here is a video from one of our partners, Chess Plastics, showing the process. Structural foam moulding is usually used for parts that require thicker walls than typical. Introducing a small amount of chemical blow agent or gas into the plastic material produces micro-cellular foaming within the components walls that significantly reduces both weight and cycle time. Lower injection pressure also means that larger than typical parts can be produced, these being able to have widely differing wall sections without creating surface defects. Parts can be more rigid, stress free and stable than if produced with conventional injection moulding. This process is ideal for the production of mouldings with thick sections that require a high cosmetic finish and/or reduction in weight. When plastic cools it typically contracts, which can leave depressions called ‘sinks’ in the outer surface. With gas injection, plastic is injected into the mould and then an inert gas (typically Nitrogen) is injected into the molten core of the thicker sections. The internal pressure prevents sinking and can also hollow out the component, so reducing weight. This involves an injection moulding machine that has two or more independent injection units. The process allows multiple plastic material types and/or colours to be combined into a single product. Each plastic is injected in turn and allowed to cure between stages. The mould tool is sometimes rotated or uses internal slides to form the separate details to be filled. Alternatively, a robot transfers the component between distinct ‘stations’ within the tool. Typical examples would be products such as toothbrushes or paint brush handles with a soft touch grip. With Insert Moulding, a non-plastic component is inserted into the mould tool. The tool is closed and plastic moulded around part of the component. Examples would be adding the handle to a screwdriver, or incorporating a brass threaded insert into a plastic knob. With Over-Moulding, a plastic part is inserted into a tool and a second polymer moulded around it. An example would be a car gear knob, where a hard inner core has a softer material moulded around it. Cleanrooms are used to control contamination levels. Moulding machines and/or assembly areas are placed inside a controlled environment, the level of control being dependant on the type of product. Medical / pharmaceutical applications are the most common, but sensitive electronics also require protection. The most basic controlled environment is a ‘White Room’, this being an area subject to higher cleanliness levels than typical. Surface contamination of plastic parts is minimised, e.g. by removing them from a machine with a robot or gloved hand and placing into dedicated containers. True Cleanrooms require a degree of restricted access, an air filtration system and specialised clothing for personnel. Contamination levels are measured in terms of particle size and number per cubic metre. The higher the level of control, the lower the Cleanroom classification, an ISO 1 cleanroom allowing only 12 particles per cubic meter of 0.3 μm and smaller. Liquid Silicone Rubber (LSR) is a highly inert material with high levels of biocompatibility, temperature resistance, compression and dielectric properties. It has excellent clarity and can also achieve very vibrant colours. The Liquid Silicone moulding process (unlike traditional high consistency rubber moulding) is a very precise process that provides excellent dimensional accuracy and flash-free parts, with high outputs and low labour content. These properties make it ideally suited for many markets, including: Medical, healthcare, cookware, aerospace and automotive. Plastic extrusion is a high volume process where material is melted and ‘extruded’ continuously through a tool (die) that forms a particular design of plastic profile or sheet in a continuous length. The product is then cut to the required length. The tools contain no moving components and are therefore cheaper to manufacture than those used in some other processes. Example products: window profiles, pipes, tubes, films for packaging applications. Here is a video by Amut Ltd. (represented in the UK by Renmar) showing the process. Blow moulding uses a ‘split’ tool that is similar to that used in injection moulding, but has no core, just a cavity. Tooling costs are therefore lower. Hot liquid plastic pours out of a barrel vertically in a molten tube that has one end open. (Called a Parison). The mould closes on it and air then forces the material outward to conform to the inside shape of the mould. When it is cooled, the hollow component is formed, the mould opened and the component removed. Examples of Blow Moulded products are bottles, fuel tanks, watering cans and containers. With Compression Moulding, a ‘slug’ of material is typically weighed and loaded (or dosed) into the heated open mould cavity. Machines are usually vertical presses and tools are relatively simple in design. The tool is then closed and high ‘load’ applied, this forcing the material to spread and fill the cavity detail. Once the material has cured, the mould is opened and the moulding removed. Any excess ‘flash’ is removed and reused. Materials include specialist thermoset grades, PVC & Rubber. Typical applications are the production of electrical sockets, isolators and connector blocks. With Intrusion moulding, hot molten material is extruded directly under low pressure into a mould (or series of moulds on a carousel), which is then cooled using air or water. Typical applications include the production of plastic fence posts from mixed recycled material. The process is not suitable for thin walled or intricate/detailed products. Normally used for low to medium production runs of very thick walled parts. The process uses two chemicals, combined in a mixing head which ‘foam’ and fill the tool, creating a hard outer surface and less dense core. Ideal for large solid products where strength is required, but weight is also a consideration. Tooling costs are relatively low, but the process is labour intensive. Liquid or powdered plastic is poured into a hollow mould which is then heated, then rotated /spun/inverted so that the molten plastic spreads evenly prior to and during cooling and setting. This is a slow process, but allows large hollow components with thick wall sections to be produced. Tooling costs are low relative to the size of the components, but ‘piece’ price is high due to the length of process and its labour intensive nature. Here is a video showing typical products and the process of rotational moulding. With this process, a sheet of plastic is heated and then either draped (Thermo-forming) or drawn by vacuum (Vac Forming) over a male or female profile to produce a three-dimensional shape. Large surface areas can be produced, and tools are relatively inexpensive to manufacture. Example products: shower trays, disposable confectionary trays, clamshells, plant trays, disposable cups and decorative wall panels. Sometimes it is not practical to mould components, for example, volumes are uneconomical, the ‘form’ is complex, wall sections are very thick, or components are very large. In these instances, machining components from solid plastic, or fabricating a solution by combining a number of individual items can be the best option. Machining engineering grades of plastic using CNC lathes, milling equipment, routers, laser cutters etc. can rapidly produce complex components with difficult to ‘mould’ features such as internal threads. Large and heavy items can be fabricated by invisibly bonding components such as laser cut acrylic or Perspex sheet. Example Products: display units, tanks and very low volume parts. This process can produce complex components without the need for tooling. Items are produced by building up lots of very thin layer of plastic over an extended period of time. Internal forms can be manufactured that would be impossible using other manufacturing techniques, but finished components have a tendency to be relatively weak and cost per item is relatively high. This process is ideal for non-load bearing applications and model making and prototyping. Specialists in this manufacturing process can be found in the PlastikCity 3D Printing category. Should Aluminium be Considered as a Tooling Material?